December 08, 2017, 1:30 p.m.
For many Republicans, there is little for Special Counsel Robert Mueller and his team of F.B.I. investigators to investigate. In the latest Economist/YouGov Poll, most Republicans doubt that Russia hacked into Democratic National Committee emails or spread fake news during last year’s campaign in order to help elect Donald Trump President. Those beliefs clearly affect opinions about the individuals involved. For example, Americans in general have a favorable opinion of Special Counsel Robert Mueller and approve of how he is handling his job. But by two to one, Republicans do not. In fact, Republicans disapprove of the appointment of a Special Counsel 48% to 36%, something a majority of the public supports by more than two to one. Two-thirds of Republicans are not particularly concerned about improper relations between the Trump campaign and Russia, something that worries half the public overall. 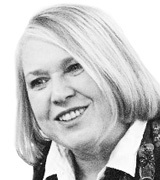 But the latest news – including the guilty plea by former National Security Adviser Michael Flynn, and the charges brought against former Trump Campaign Chair Paul Manafort – may be starting to change at least some minds. Republicans were divided in their opinion of Flynn in the months after he left the Administration. They are now clearly negative towards him. And just about twice as many Republicans have an unfavorable opinion as have a favorable one about Manafort. Senior advisor and Presidential son-in-law Jared Kushner, apparently the senior transition official Flynn spoke to about meeting with the Russian Ambassador, continues to be favorably viewed by Republicans in this poll (47% to 21%). The overall public has a different view: just 21% have a favorable opinion of Kushner, 42% are unfavorable. The indictments and guilty pleas have not turned Republicans into fans of the investigation, but they have given them pause when it comes to wanting to end it. This week, more Republicans do not think the President should fire Mueller than do, though the margin is narrow. That was an action they were narrowly in favor of a month ago. Republicans doubt the President has tried to influence the investigation. By 62% to 17% they think he has not; the public overall say he has tried to influence it (47% to 30%). Americans now are little more willing to believe there was some wrongdoing during last year’s campaign, at least when it comes to members of the Trump campaign staff. In the last month, the share that think campaign officials, though not the candidate himself, did things that were either illegal or improper in their dealings with Russian officials before the election has increased slightly. Republicans are increasingly unsure about what they think: the percentages of Republicans who see nothing illegal or improper dropped by double digits. Even when it comes to Michael Flynn, who has pled guilty to lying to the FBI, Republicans aren’t sure he actually did anything improper: 19% of Republicans think he did, but twice as many (39%) say he did not. Americans divide along the usual party lines on whether President Trump did anything illegal or improper in his own dealings with Russian officials before the Inauguration: 40% believe he did something improper, 37% that he did something illegal. Party identification determines many beliefs. One that remains a bright line between Republicans and the rest of the country is the one championed by President Trump in the years before he ran for office: Where was President Obama born? 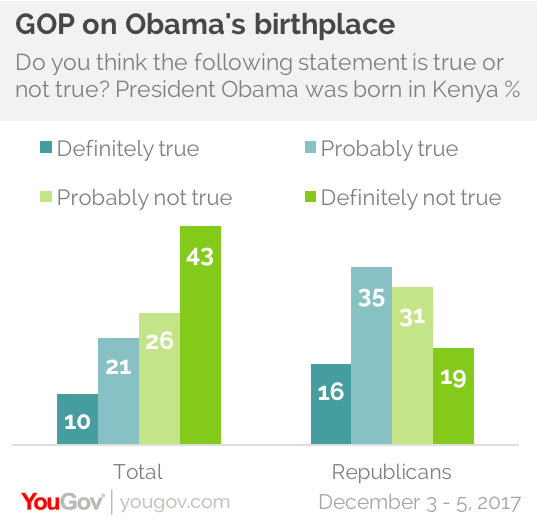 Most American adults disbelieve the claim that the former President was born in Kenya, but nearly one in three American adults say that it is definitely or probably true that he was. More Republicans – 51% – believe that to be the case. People’s beliefs on this question, with or without evidence, don’t seem to change. Responses were nearly the same one year ago. Read the full results and tables here.